Open-government model in the Basque Country was one of the first strategies which appeared in the international context, based on the principles of transparency, participation, and collaboration. This chapter contextualizes, first, this open-government policy. 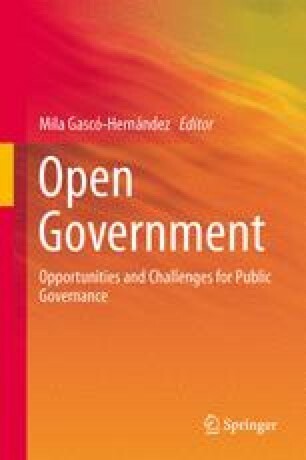 Secondly, the chapter describes the most significant initiatives that the Basque Country has undertaken to develop its model of open government, showing its strengths and weaknesses. The final discussion reflects on the progress made and to-dos. Thank you very much to Rebeca Coriat and Gaizka Llona for helping us in the translation and revision of this text. This chapter has been built and revised in a collaborative way using Google Drive. Basque, G. (2011). Plan de Innovación Pública del Gobierno Vasco 2011–2013. http://bit.ly/1bLPDY7. Accessed 27 July 2013. Basque, G. (2012a). Plan de Innovación Pública del Gobierno Vasco 2011–2013. Informe de seguimiento. http://bit.ly/141skHH. Accessed 27 July 2013. Basque, G. (2012b). Style and usage guide for the Basque government’s social networks. http://bit.ly/ZxYz7O. Accessed 15 March 2013. IREKIA (2011). El modelo de Open Government vasco servirá de guía para 44 países americanos. http://bit.ly/ZWXBos Accessed 15 March 2013. IREKIA (2012). What is Irekia. http://bit.ly/14l594V. Accessed 15 March 2013. Gavelin, K., Burall, S., & Wilson, R. (2009). Open Government: Beyond the static measures. OECD. http://bit.ly/14l5Z1F. Accessed 15 March 2013. Lathrop, D., & Ruma, L. (2010). Open Government. Collaboration, Transparency, and Participation in Practice. CA: O’Reilly Media. http://bit.ly/XOxbpT. Accessed 15 March 2013. OECD (1987). Administration as service: The public as client, Paris: OECD. http://bit.ly/Y8SI8K. Accessed 15 March 2013. OECD (2010). Building an open and innovative government for better policies and service delivery. Paris: OECD. http://bit.ly/ZajiiC. Accessed 15 March 2013. Ortiz de Zárate, A. (2009). Los nuevos directores de modernización y atención a la ciudadanía. In “Administraciones en Red” blog. http://bit.ly/13PvSLg. Accessed 15 March 2013. Ortiz, I. (2010). IREKIA, un primer paso. In “Administraciones en Red” blog. http://bit.ly/ZajDC0. Accessed 15 March 2013. Ramilo, M. C. (2010). Irekia: Gobernu ireki baterantz. In Administrazio Euskaraz, nº 68 (pp. 21–22). http://bit.ly/15tA69A. Accessed 15 March 2013. Transparencia, I. E. (2012). Index of communities autonomous (INCAU). http://bit.ly/Ua0EGB. Accessed 15 March 2013. White, H. (2009a). Transparency and open government. http://1.usa.gov/8eo8tl. Accessed 15 March 2013. White, H. (2009b). Open government directive. http://1.usa.gov/4sbQJk. Accessed 15 March 2013. Yu, H., & Robinson, D. G. (2012). The new ambiguity of “open government”. UCLA Law Review Discourse, 59, 178–208. http://bit.ly/1c0h7I3. Accessed 15 March 2013. Zubero, I. et al. (2012). El modelo vasco de Open Government: Caracterización y evaluación. Civersity Research Group. Basque Country University. http://bit.ly/14DMoz4. Accessed 27 July 2013.